What is someone actually designed a U-shaped neck pillow that was up to the job? Not just a sausage filled with rice that doesn’t do anything except add to your luggage, but a pillow that fully supported your neck, and packed away into a handy stuff sack for easy travel? These are the questions behind the Unclesign Uno, a U-shaped travel pillow with some key design advantages. Unclesign, a design startup based in Taiwan and about to show-off its creation at designjunction London, has designed something that’s all about form and function. TravGear used it on a series of short-haul flights around Europe. Uno is really soft, and inside is memory foam to create the perfect pillow on aircraft, trains and buses. However, in use the memory foam didn’t prove the really the big development on its own. There’s a strap that tightens the Uno into position at the front, and we found that it was this that gave the memory foam the 360-degree support. 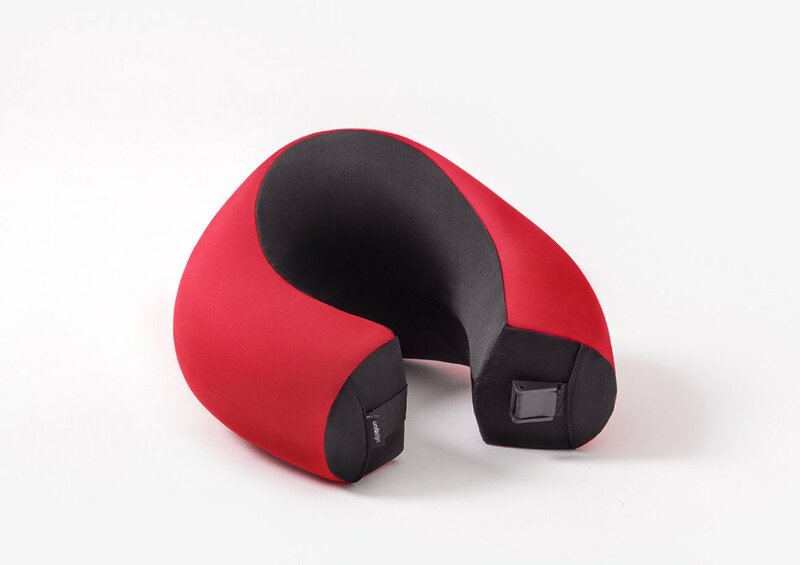 The key design is the larger, eye-shaped design from the back, which gives a lot more support to the neck than most U-shaped travel pillows. But Uno also seems to wick away sweat. Used in a humid airline cabin coming from southern Spain, it was always comfortable and never seemed like a compromise. We also liked how it stuffed into a small stuff sack (measuring 19x12x12cm) and weighed 426g, which makes it a great choice for long and short-haul travel. That stuff sack even has an elastic strap to hook to the column of luggage handles. Although it’s most handy in economy and cramped conditions, it has just as much use as a regular pillow in business class or first class when used on a lay-flat chair/bed. The Unclesign Uno neck pillow is available in white, blue, grey and red.